Farrar, Straus and Giroux, 9780374161095, 448pp. There has been more than half a century of raging conflict between Jews and Arabs—a violent, costly struggle that has had catastrophic repercussions in a critical region of the world. In Genesis, John B. Judis argues that, while Israelis and Palestinians must shoulder much of the blame, the United States has been the principal power outside the region since the end of World War II and as such must account for its repeated failed diplomacy efforts to resolve this enduring strife. The fatal flaw in American policy, Judis shows, can be traced back to the Truman years. What happened between 1945 and 1949 sealed the fate of the Middle East for the remainder of the century. As a result, understanding that period holds the key to explaining almost everything that follows—right down to George W. Bush's unsuccessful and ill-conceived effort to win peace through holding elections among the Palestinians, and Barack Obama's failed attempt to bring both parties to the negotiating table. 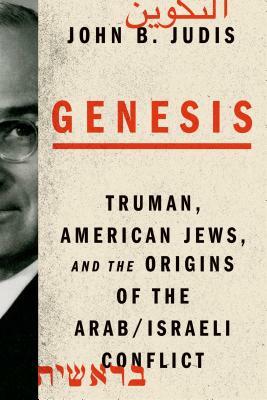 A provocative narrative history animated by a strong analytical and moral perspective, and peopled by colorful and outsized personalities and politics, Genesis offers a fresh look at these critical postwar years, arguing that if we can understand how this stalemate originated, we will be better positioned to help end it. John B. Judis is a senior editor at The New Republic and has also written for GQ, Foreign Affairs, Mother Jones, The New York Times Magazine, and The Washington Post. He is the author of The Folly of Empire and The Emerging Democratic Majority, among other books.